Programmers are talented, smart, skilled professionals. We put in lots of our own effort to educate ourselves and stay up on current technologies. We work hard and we feel great satisfaction in our achievements. We donate our time to charities when the opportunity arises. We give back to our local communities. All things considered, there are a lot of really great programmers in the world. I lead a team of software developers. Does that mean I am the “best” programmer on the team? Certainly not. It just means that I lead the team. As the leader of the team, it is my job to: inspire, encourage, trail blaze, and motivate my team to be the best they can be. So who is the best programmer on my team? I don’t know, and I don’t care. There shouldn’t really be a “best” programmer on the team. 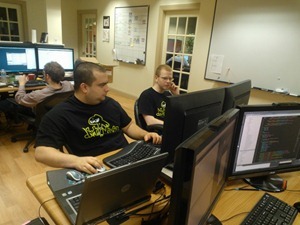 Everyone on the team is great and working hard. Sometimes it makes sense for a more experience developer to work with a less experienced developer. A common first instinct is that the senior person is mentoring the junior person, but it’s actually going both ways. 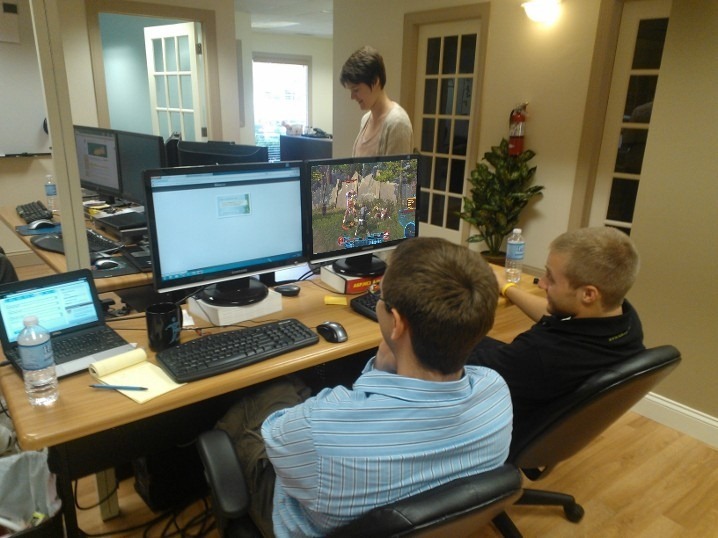 Each of the two developers is bringing a lot to the table. Their different experiences and views allow them to each approach the problems differently, ask different questions, and apply different, existing knowledge. If either person’s ego gets in the way, it would prevent the 2-way knowledge transfer in addition to creating friction between them. 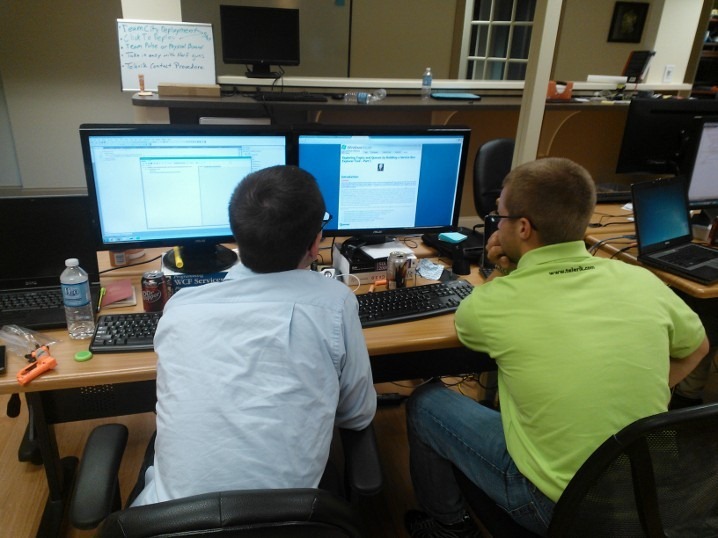 One Developer and one Junior Developer can pair on a task and share knowledge. Does one act like the other one is just along for the ride? No. Your pair partner, is watching your back, guiding the team, and keeping the pair honest. Which one does that job? Both. If you had one person drive the whole time, you’re not going to see the benefits of pair programming. If you let your ego get in the way, you might not let the junior developer write any of the code. They may not know every library, every design pattern, or even the intricacies of the language they’re using, but those guys can write some great code. I don’t know how the Junior Developers are on your team, but ours write great code and show a high level of professionalism in their work. And sometimes you get a Junior Developer pairing with the Developer Intern. How the pairs split up doesn’t really matter. Who is working with whom doesn’t really matter. Each and every member of the team is bringing something to the table, and it is this interaction that is making the team as effective as it is. These two are as productive a team as any other pairing that we’ve got. Someone is probably reading this and thinking I am crazy for letting a Junior Developer and a Developer Intern pair together. They’re good though, and they really get great stuff done. We can accomplish a lot of stuff when our team works individually, however, we can accomplish a lot more as a group. You might be the “best developer” on your team, but if you keep thinking and acting that way, you’ll be missing out on a lot. I learn a lot when I pair with any member of my team. It doesn’t matter how much experience the person has. Everyone knows something I don’t, and no one approaches the problems exactly the same way I would. There is no “Ego” in “Agile Team”, so don’t bring yours to an agile team and expect good results. When writing software, we often have to write comments to explain why we did something. I try to write my code such that I don’t have to comment it. In fact, anything other than a temporary (less than a few minutes) comment I write, I consider to mean that I made a mistake. We could get into endless discussions of when we should comment, what we should comment, and how much we should comment. I’ve had plenty of discussions about comments with people with various opinions on the subject. An interesting feature of Visual Studio is that it lets you create a list of “tasks” by leaving yourself comments that begin with “TODO” or “HACK”. In some ways I like those comments, because they build into the code reasons for why the code is the way it is. If you write “TODO”, it tells the reader that the code is incomplete and that wasn’t intentionally left the way it is. There just wasn’t enough time. If you write “HACK”, it admits that you wrote the code badly and it needs to be rewritten. These types of comments fit in very well with what I tell people about comments. Each one I write and leave in the codebase means that I didn’t write the code as well as I wanted to. Each one is my mistake. The more comments I write, the worse the code is. One codebase that I was working on had a lot of these comments. It seemed they were all over the codebase. There was the other problem that copy-paste coding was rampant, so I am sure that many of these were copied and pasted from previous locations. Heck some of the even said to remove the duplication. The irony? Those comments about removing the duplication were copied with each new instance of the code that was copied. I checked Visual Studio’s task list of these comments just to see how bad it was. 1131. 1131 tasks that were indicated with “TODO” and “HACK” comments. That takes more than just writing a lot of these comments. That requires writing them and never going back to fix them or complete them. Check your codebase right now. Do you have any of these comments lying around? Is it only a handful? If so, you should go try to clean them up. That’s easy and will help you out down the road. Anytime that you’re going to write a “TODO” comment, think about why you’re putting it there? Is it something that’s really needed? If so, make yourself a note somewhere else. Add a story to go back and make the change later. Get it in the system where you really track your work. If you know that you’re not going to get to it any time soon, don’t bother with the comment. It will only clutter up your system. If it’s not important enough for you to come back and get it soon, why are you even recording it? If it’s important later, you will be working in that part of the codebase again and you can go back later and fix the code as part of your other work. Certainly once you get that many of the comments, you should have long earlier realized that there is something that you need to work on. That’s just a ridiculous number of TODO and HACK comments for one codebase. Has anyone ever see more than that? Anyone think I am crazy or wrong? Tell me about it in the comments! Keep watching for more interesting nuggets of stuff that I’ve seen in codebases. In software development, it is common to have users authenticate using usernames and passwords. In order to handle the authentication process, we must store this information in some way. Obvious, passwords should never be stored in clear text. Toward that end, when we store them, we encrypt, hash, salt, etc. to keep them safe. While these steps cannot protect against all forms of attack, they’re a good base of protection to have in place. We don’t want to just give this information away to anyone who wants it. Yes, some people could take the non-clear-text passwords and obtain the original password from it, but we’ve certainly set the barrier higher. Security is all about setting more and larger hurdles in place for people to jump over. The only secure information is information that doesn’t exist, and that becomes inherently insecure as soon as it does exist. If information is accessible to someone, it means that it’s possible for someone else to access that information also. We just try to make things more difficult and limit that damage. Or at least some of us do. I’ve made plenty of my own mistakes in the past. Some of the applications I wrote in college have security holes, which seem glaring to me now, but I’d not even noticed at the time I wrote the code. I’m sure that most people reading this would say the same thing about their own code. The developers knew that they needed to encrypt the passwords, so they wrote some sql, dbo.encrypt, to encrypt passwords before storing them in the database. Insert a password and out comes a jumbled mess that no one could read. Users will often forget passwords, and will need some way of recovering from this situation. I recommend resetting passwords when this happens. This application took a different approach. Also stored in the database was some other useful sql, dbo.decrypt, which would take any of the encrypted passwords and decrypt them. Well that’s obviously a security issue, but the worst thing about this isn’t just that it’s reversible. It’s that this is also in the database. That means that we have the lock and the key together. If someone gets read-only database access, but not access to the application’s source code, they still have everything. It’s like have a lock and keeping the key inside the lock for convenience. I wouldn’t want to have to call a locksmith if I ever lost the key, so I just keep it here. It makes opening the lock faster too! Don’t allow reversing of stored passwords. Use 1-way only when dealing with passwords. This way brute force techniques are required to figure out a password. If the system can reverse the password back to the original, anyone who has obtained access to the system can retrieve all of the passwords. This isn’t a new idea. You’re not the first developer to set up authentication in an application. There are plenty of existing authentication systems out there. Don’t reinvent the wheel if you don’t have to. Some systems are safer than others. Ask around. Talk with security experts (I am not one of them) about these if your application requires really high hurdles. When and how much time to spend refactoring out code is one of the best questions that a budding software craftsman will ask. It’s one I’ve asked and answered many times. There isn’t one specific answer that is better than all of the others. It always depends on your personal preference, the restrictions of you client, company, or team, your code base, your language, your version control, and many other issues. 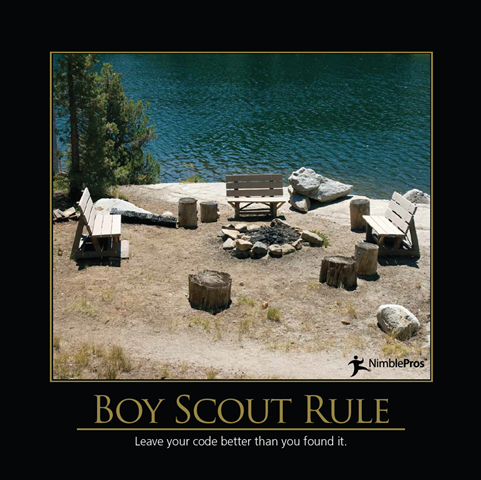 One rule, which is the one that I follow and encourage others to follow, is the Boy Scout Rule. It’s based on the “leave the campsite better than you found it” idea. It’s often said to be a line related to the scouts, but it seems to work well for code also. If you have some old code that needs refactoring, I would guess it’s not tested. Since it’s not tested, you run the risk of creating bugs even if you’re testing it while refactoring. Some small changes will need to be made in order to test the code. You could miss something. That makes it dangerous. This is why you want to keep your refactoring to small pieces at a time. When and where you refactor are the next questions. The Boy Scout Rule answers these questions nicely. You want to refactor the code you’re working on now. It’s fresh in your mind. You know how it’s supposed to work since you’re in there making changes now. It obviously is a volatile place, which should be cleaned up. You’re in there changing it now aren’t you? Plus your current change might make things worse if you don’t do a bit of refactoring first! The 2011 NimblePros Software Craftsmanship Calendar featured the Boy Scout Rule in the month of July, so for the rest of July, try to do small pieces of refactoring as you go into parts of a legacy codebase. Rewrite some code, write a test if you can, update an outdated comment (if you don’t just remove it), or even just write a better variable name. It’s all about incremental improvements. The agile community should be loving this rule, since it is all about incremental changes and improvements. Enjoy the rest of July! 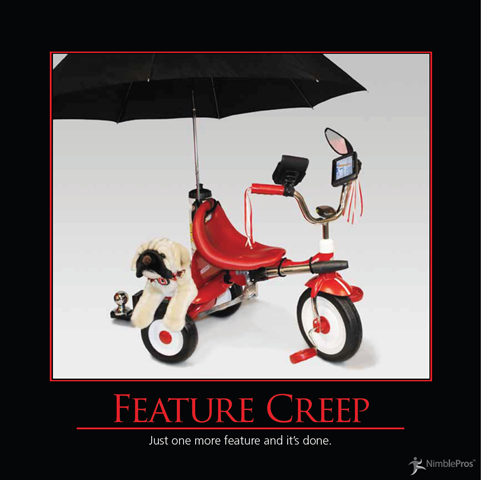 Don’t forget that you should also be avoiding Feature Creep. I think we’ve all heard about the great security policies that companies implement. Companies want you changing your password every other day, without repeating any passwords you’ve ever used, without using any characters from your first name or last name, without having any numbers associated with your address, phone number, birth date, the current year, or your age, and they want your password to be exactly 12 characters. All of these rules are really funny. I don’t think I need to tell too many people that there are better ways of creating passwords. All of that aside, those rules are kind of interesting. I use a lot of different passwords. I change the important ones. I don’t change the unimportant ones. When companies implement these policies, they like to have software in place to enforce the policies. Now is a great time to discuss how not to manage these policies. In this instance the company requires that passwords be changed every 2 months. The passwords cannot contain more than 2 consecutive characters from the person’s first and last name (challenging to avoid as a user creating a password). You cannot use any of your last 3 passwords. I was going to be rewriting this logic in a new system. I asked a few questions about this. One important questions is, if the password needs to be updated if the person’s name changes. For example they could have gotten married and may not be violating the password not containing consecutive name characters issue. Since I can’t find out what their password is in code, I have to just make them change the password. This company obviously cares about securing this information since it’s implementing this password policy. The application is using salted, hashed passwords when storing them in the database. That’s good. I later noticed how the existing system handled password history. Clear text passwords stored with the username all in a table in the database. Every single password every user had ever used on the site. This is a scary pile of passwords that likely get used all over the Internet by these users. It even included the current password being used by that user. These should not be stored this way! If you have to keep passwords around, keep the hash only. Also, get a new salt with each new password. Treat these as passwords (they are!) Don’t be foolishly insecure with this stuff. If someone accessed that database, they would have usernames and passwords for people to try all over the Internet. That would be a huge disaster. If you have to keep that kind of information around, at least don’t have it in clear text. It would also be a good idea to limit the information that is there by removing the old passwords that are no longer relevant. Since they only care about the last 3 in the history, there is no reason to keep any more than that. Remove the old ones. To be honest, I also don’t think that those types of password policies are all that secure anyway. I am sure that there is a weak link somewhere in the human element that would render the policy useless anyway. Static methods are very useful and powerful tools when writing code. As I am sure many people have pointed out, these tools should be used sparingly and cautiously. Statics are dangerous if they have dependencies. This is because they’re hard to test. Or so I thought. Keep in mind, that just because you can mock statics does not mean that you should be using a lot of statics. I saw a great case of this misuse of statics in some cross-cutting code. It would be a great place to use Aspect Oriented Programming, but was instead a mess of statics and dependencies. This cross-cutting code was being used throughout the application. There was barely a section of the site that did not use this code. Not once in the code had anyone unit tested any of the code that used these methods. It wasn’t being mocked, so there wasn’t really a way to unit test anything using that code. Starting things off is a class. As you can probably have guessed from this post’s title, it has a static constructor. In the constructor, it accesses a database and creates an instance of the class. Each of the methods in this static class take in parameters and then write to the file system. I was trying to write code in this code base, but I could not make any changes yet. I needed to get that monster abstracted so that I could work around it. For cross-cutting concerns like this, it’s common to use statics. That’s OK. Not ideal, but OK. You just need to be careful. Try to limit the damage. If done nicely, the Singleton isn’t horrible. Just keep in mind that tests will need to mock out that singleton when you’re using it. For this class, I wrote a wrapper around it that implemented an interface. My code depended solely on that interface, and I mocked the interface in my tests. This let me minimize the impact of the change. In the long run, It will be important to make sure that the wrapper gets used throughout the codebase. Anywhere the static was used, it should not depend on the wrapper. This is a quick, easy solution that slowly improves the code. In my opinion, that’s the best way to clean up any code base. Just fix a piece at a time. Make sure that when you touch any other part of the code that you use that same wrapper and eventually things will start looking a lot better. I am coining a new term and have just googled to make sure that it’s not written anywhere yet. “Massive Multiplied Methods” did not appear in a Google search at all. I establish that I am likely the first person to post those 3 words together in that order on the Internet. I am sure that everyone reading my blog knows that you should not repeat yourself and that your code should be organized in small cohesive parts. Sometimes developers don’t do that. Occasionally, we can find places where people completely ignored those two. Imagine a site whose content comes from editors uploading lists of content stored in spreadsheets. Each spreadsheet, for some reason, has to have only 1 type of content (even though the data all has the same fields). Now imagine that when the system reads each row from the spreadsheet, it needs to map each value onto a specific record from the database. The data is normalized, so what was a string in the excel file needs to link to the correct other table in the database. The user selects which type of content is being uploaded and then the system will call the method for uploading that content. Yes, it’s just one method. Any other methods called are part of the .NET Framework. Making things worse, the methods are long. Very long. Each one was about 1,500 lines of code. There were 5 different types. Each of these types has its own 1,500 line method. That’s about 7,500 lines of code for these. And the best part about those 5 methods? They’re all identical except for 1 string. Literally, the only difference between these methods is the magic string literal used for the type. I am not sure what to say here other than. Go learn about parameters in methods and how to create methods to break an algorithm into logical parts. Wow. Just. Wow. It’s bad enough that the string could have just been in the spreadsheet to begin with, but did it really require 5 separate methods? We’ve all been there before. Our project is moving along just fine. The release date is in sight. We’re on track to get everything pushed out right on schedule. Then everything is derailed by a last minute must have new feature. Maybe it’s the differentiator that will raise your product out of the crowd. Perhaps it’s just one small feature that will only push back the release by a day or two. When you’ve finished that one, however, will you have any additional must have features? This is called Feature Creep. It’s when new features get added to the scope, and often, these features will cause delays in the project. As a proponent of agile development, I approve of clients adding new features, however, it’s important to understand that adding in a feature should mean replacing a previous feature or you’ll have to push back the release date. It’s important to understand that with many (certainly not all) software projects, you can update the software at some point within the next few months with new features. It’s important to release something to the client. Adding on more and more new features right before a release will just mean a delayed release. The NimblePros 2012 Software Craftsmanship Anti Patterns calendar for the month of July is about Feature Creep. So for the month of July, make sure that you watch to make sure that your scope is not ever increasing and pushing off release dates. Shipping is a feature, and your product should have that feature also. If you keep pushing off the release date, it will never ship. Once the airbag, rocket boosters, seat belts, and parachute are added to this bike it will be done. Oh. And an ejector seat. We also need to add spokes, so I can put a baseball card in them. We need a bell too. And a horn. It won’t take long to paint it blue will it? Can we add padding to the seat? That’s the last feature. I promise. Oh I forgot about the mud flaps. Once that’s done we can ship it. As long as there are pegs on the back for passengers. No user could ever find your “hidden” inputs. You’re a master of stealth and the HTML hidden fields are totally safe and secure for whatever you want to put there. That’s why they’re called “hidden”. Obviously. In simple terms, these are HTML controls that sit on a page and have no display for users. They’re only “hidden” by not being in plain sight. It’s like hiding something behind a curtain. 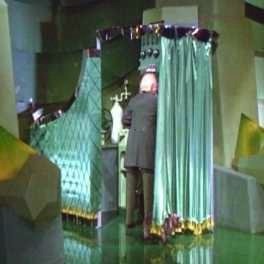 It makes it easily ignored, but anyone can decide they want to pay attention to that man behind the curtain. When a user submits a form to your server, it will also post the values of the hidden fields. These are occasionally useful for developers, but are not a place for secure information. You might have an unimportant value you want to maintain. Never put any information in a hidden input that shouldn’t be seen or modified by a user. One project that I had the pleasure of looking over for someone was a homebrew ecommerce application… Yes, this one is going to get scary. When you buy something from a site, it will often show you some prices and a total for your order before you checkout. This application had a rather genius location to store the total price that you would be paying. It kept the total in a HiddenInput, so that when the user confirmed the order it would send that up to the server for processing. I think this was a form of making sure that the same value shown to the user was what they paid. I can only assume that the developer was trying to avoid the values changing in the system and the customer paying a price different from what was shown on the preview. The danger, however, is that if you want to pay $0.01 for anything on the site, you can just change the hidden input value to 0.01 and then submit the page. Sure it takes someone with some web knowledge to do that, but anymore that’s not a rare thing to know about. The really cool part is that the system used that value to send to the credit card processor and actually recorded the full detailed list when it logged it. That means that the site logged everything correctly and when it processed the order with the card company it used the amount you specified in the hidden input. Yes, you could totally have ripped them off and their own sites records wouldn’t even show it! If you’re thinking about trying this on that site, I am sorry to burst your bubble. I told them about that issue and they fixed it. Less cool than the above example, I’ve seen AccountIds stored in hidden inputs as well as other values that shouldn’t be kept in those locations. I’ve yet to see passwords stored there, but I am sure it’s been done somewhere by someone. Make sure to keep all information that requires any level of security or control on the server. Never ever put something like that on the page. Information that should be shown to a user in a read-only fashion should be treated as such. When sent to the client, it should be displayed only. Those values should be left with the client and only information from the server should be trusted. If you need to store that information somewhere, put it in server memory in some kind of state or store it in the server’s permanent storage. User sessions are great for storing user-specific information. In the case of the shopping cart, you could use some of that in-memory storage like session or you could store a temporary record in the database of that cart. I am not going to get in the specifics here, but make sure that you get it stored somewhere that users don’t have access to it. Today we’re going to take a look at something that I’m sure most of you have seen before. We’re talking about classes that have grown so large that they’ve earned the size category “massive”. These classes can sometimes house an entire layer of an application. Who would create these monstrosities? Usually it’s a team of malicious, evil developers who are trying to ruin your day. The devised a clever way to make your development experience terrible; they create a massive class and make sure that you end up having to maintain/repair/modify the code. I could write all day long about different instances of these that I’ve seen, but instead of boring you, I will only talk about one of the worst offenders I’ve ever seen. One fantastic code base we inherited was built using a “great” technique for organizing the code. It’s simple approach state that any time you needed to do any data access you could just go to the class named, “MasterDAL”. What made this so great? Well, you always knew where the method you needed would be. What is wrong with that? Well, it was quite common to have 2 or 3 methods that did the same thing in that massive class. Sometimes you had a few methods that all did the same thing, but each one did it slightly different. The really fun part is that some of them worked and some of them didn’t. It was your job to make sure that you used one that had been updated and had its bugs fixed. How big was MasterDAL you ask? That file alone was over 50,000 lines long. It was not auto-generated. It was written by developers. OK, so something I told you so far about this wasn’t true. The code wasn’t really this nice. It gets better. I lied about there being 1 place for everything. MasterDAL was the master data access layer. There were two other data access layers. Luckily those ones had much more specific names and were not as general or as large as the MasterDal. MiscellaneousDAL and OtherDAL were each only about 20,000 lines long. Obviously the miscellaneous data access and all the other data access go in those. That’s how they’re different from “Master”. Oh and did I mention that not only did it have repeated code internally, but it also had some methods repeated in the MasterDAL. I know you’re surprised now. Please always make sure that you’re organizing in smaller classes. Go read about the Single Responsibility Principle. It will explain that we need to organize our code. We also need to not repeat ourselves quite so much. There are so many great ways of dealing with data access. Go get yourself an ORM or just use Entity Framework. I don’t care how you do it, but use one of those. Go read about some designs for organizing your data access code. There are so many good options out there. There’s no reason to create these big messes.